The texture of the ocean floor is determined by the enormous stretching and cracking that takes place at the mid-ocean ridge, where tectonic plates are pulling apart and magma is rising to form new sea floor. On either side of the ridge, rows of abyssal hills form and then move away as the plates pull apart over time. Exactly how those forces combine to influence the size and shape of the hills, however, hasn’t been entirely clear. A provocative study released earlier this year suggested that climate change may play a role – it attributed the frequency of the abyssal hills to the amount of magma rising, magma that a concurrent study showed is sensitive to changing pressure on the ocean floor as sea level rises and falls during warm periods and ice ages. The idea that we might be able to read climate history in the sea floor is exciting, but while rising magma likely is modulated by changes in sea level, the claim that climate determines abyssal hill spacing doesn’t match observations from all the world’s oceans, say the authors of a new paper published in this week’s journal Science. 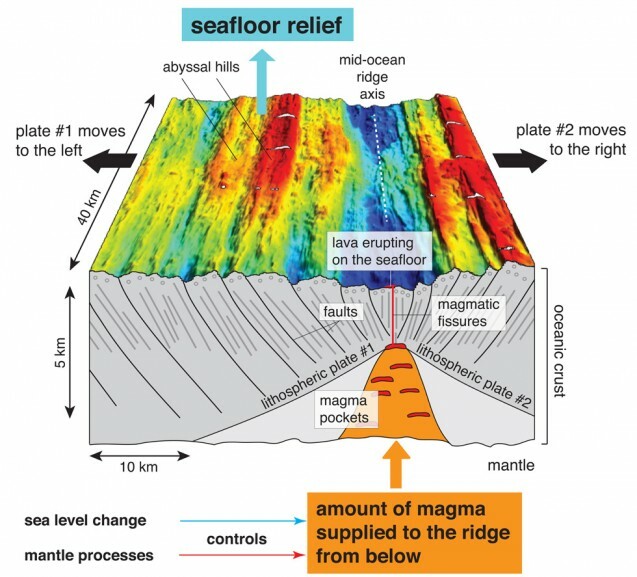 Jean-Arthur Olive, the lead author of the new study and a post-doctoral research scientist at Lamont-Doherty Earth Observatory, and his co-authors argue that the fabric of the sea floor is better explained by faults that form, offsetting the crust as the plates pull apart. The authors combined sea floor observations with recently developed models of mid-ocean ridge dynamics to test the climate theory from several angles and found that even large fluctuations in melt supply at the height of ice ages and warm periods didn’t affect the fault process shaping the sea floor. Physical signals of the changing pressure of rising and falling sea level on the ocean floor may still be present, but those signals are more likely to be picked up in the thickness of the plate, the authors say. The new paper is the first to explain the characteristic spacing of abyssal hills quantitatively as a function of seafloor spreading rate within a single theoretical framework. That texture matters because it influences ocean currents, which influence how ocean water mixes and flows. To visualize what happens at the mid-ocean ridge, try this experiment, a favorite of Lamont-Doherty geophysicist and research professor Roger Buck, a co-author of the new paper. Take a Snickers bar with both hands and try to pull it apart. You’ll see that the hardened outer shell of chocolate cracks, while the gooey middle stretches. As you pull on the candy bar, stress builds up and the chocolate shell weakens, finally cracking at the weakest points. If you were to inject molten chocolate between the gooey center and the outer shell – simulating magma at the mid-ocean ridges – the molten chocolate would flow into those cracks as soon as they formed, reducing the stress. “We’re arguing that it’s pretty much the same process,” Olive said. “You’re adding melt from below. If you don’t have a lot of melt being supplied to the ridge, you’ll see lots of faults.” The big faults develop and grow and move to the side with the spreading of the plates while melted mantle intrudes. At some point, too much energy is required for the faults to continue to grow, a new fault forms near the ridge, and a new hill is created. The visual difference in the spacing and size of abyssal hills along the Atlantic and Pacific mid-ocean ridges first raised questions in the authors’ minds about the climate paper. At the Mid-Atlantic Ridge, where less magma is produced, you’ll see large hills on either side of the ridge with sharp scarps where faults opened up and slipped to release stress. They can be 5 to 10 kilometers apart and look much like a row of books that has tipped over on a shelf, Olive says. At the East Pacific Rise, where more magma is flowing and the plates are pulling apart faster, the hills are smaller, as little as 2 kilometers apart, and the sea floor is smoother. If past climate cycles had influenced the spacing of the hills, the faster spreading in the Pacific should have meant hills farther apart, Olive said. Lamont-Doherty scientists have been involved in research into plate tectonics and other processes at mid-ocean ridges since the 1950s, when Marie Tharp used seismic data collected from ships to develop the first complete map of the ocean floor. She found distinct ridges through the oceans that were symmetric on each side. Sediment eventually smooths the floor farther from the ridge, but close to each mid-ocean ridge the roughness of the abyssal hills is clear. Co-authors on the new Science paper included Mark Behn of the Woods Hole Oceanographic Institution, Garret Ito and Sam Howell of the University of Hawaii, and Javier Escartìn of the Institut de Physique du Globe de Paris.